Health and safety is a very important consideration in any workplace. Under the UK health and safety law it is a legal requirement that all mechanically loaded storage equipment have safety load notices clearly displayed. This means that any type of pallet racking loaded with a forklift truck must display a safety load notice regardless of its location or setting. Load notices are signs which tell end users how to use, how to not to use, and how to safely maintain the racking system. Load notices need to be displayed clearly. Without load notices, end users run the risk of overloading the system. Which in worst case scenarios can lead to racking collapses and fetal injuries. If you are unsure if your load notices are correct give us a call. We offer free of charge advice service to keep your warehouse pallet racking as safe as possible. We also offer a wide range of pallet racking safety products and accessories from rack end barriers through to warehouse safety netting. It is important to have an annual pallet racking safety inspection carried out. 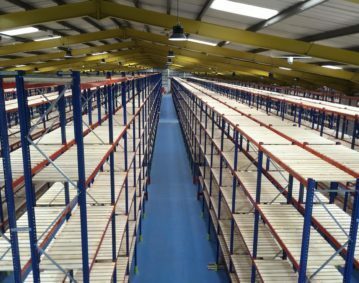 The pallet racking inspector will check not only if the safety load notices are in place but also that they are suitable.